SEOUL (Yonhap) -- South Korea sent a letter to North Korea on Aug. 26 regarding the North's participation in the Asian Games to be held in the South Korean port city of Incheon in September in reply to the North's letter of Aug. 22. Inter-Korean consultation has been suspended since July 17, when the working-level talks were ruptured as the North Korean delegates unilaterally walked out of the meeting held at the truce village of Panumunjom inside the demilitarized zone (DMZ). South Korea promised in the letter to provide administrative and other necessary support for North Korean athletes and officials who will participate in the Games. It also gave the green light for the North to send its delegation by air over the militarily sensitive Yellow Sea route, according to officials here. Seoul delivered its position to Pyongyang in the two-page letter signed by the organizing committee for the Incheon Asian Games, as the two sides began written consultations over the logistics of the North's delegation. 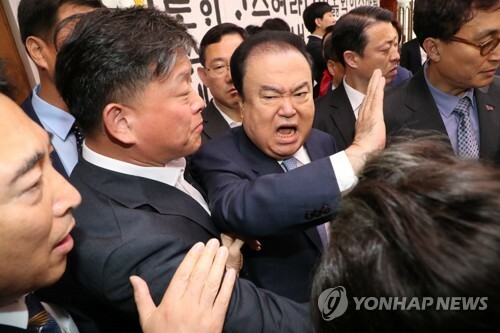 "Our stance is that there is no problem with the North's plan to use the Yellow Sea route for a flight carrying the delegation," a senior official at the unification ministry said. "Other working issues were included (in the letter) as well." The official indicated that the South is willing to show some flexibility on the cost of the North's delegation's stay in South Korea during the Sept. 19-Oct. 4 games in Incheon, west of Seoul. The North in the Aug. 22 letter announced plans to dispatch 150 athletes, along with 123 coaches, referees and other officials, to the Asian Games and proposed to discuss relevant matters in writing at the government level but did not mention the cheerleaders it had said it was going to send. The South Korean government is willing to provide as much support as possible for the North's delegation, according to the ministry official. "We will review relevant issues in accordance with a position to provide assistance necessary for the North Korean athletes and coaches to join the Games," he told reporters on background. In the letter, however, the South did not touch on the North's plan to send hundreds of cheerleaders, he added. He would not give further details, saying that negotiations are still under way. Although the matter of North Korean cheerleaders was omitted in the letters the two Koreas exchanged, there is a high possibility for the two sides to discuss it later. A ministry official said North Korea will make a proposal (for the discussion of the cheerleaders) if it is really intending to send them. He explained that it is not proper for Seoul to raise the cheerleader issue first. On July 17, the two Koreas failed to reach a deal at the Panmunjom working-level talks over the issue of who should foot the bill for the North Koreans' stay in the South. They even failed to set a date for the next meeting. In the session, the North revealed plans to send 350 athletes to the Incheon Asian Games. It also said it will dispatch the same number of cheerleaders. Concerning the bill for the North Korean delegation's stay here during the Asiad period. Seoul said its basic principle is to follow international practice, a break from its tradition of financially supporting visiting sporting delegations from the North. The North took issue with the South's stance, calling it an "act causing the breakdown of talks," according to an official involved in the meeting. "We express deep regret over North Korea's unilateral attitude," the official told reporters on background. "We hope North Korea's participation in the Incheon Asian Games will be realized." North Korea demanded that South Korea provide "a range of support" for its delegation without elaborating, he added. Meanwhile, North Koreans will be able to watch the Asian Games in their homes on television as the (South) Korean Broadcasters Association (KBA) has decided to offer the TV broadcasting rights to North Korea for free. The Korean Sports Broadcasting Development Council under KBA, which owns the broadcasting rights, said on Aug. 26 that the three council members -- KBS, MBC and SBS -- decided to offer the free broadcasting rights to North Korea in accordance with humanitarianism and sports spirit. The decision was made at the request of the North Korean Radio and Television Broadcasting Committee (KRT) and submitted it to the KBA via the Asia-Pacific Broadcasting Union. The South Korean broadcasters have offered free TV rights to North Korea for past global sports events, including the 2006 World Cup in Germany, the 2010 World Cup in South Africa, the 2010 Winter Olympic Games in Vancouver, the 2012 London Olympics, the 2014 Sochi Winter Olympics and the 2014 World Cup in Brazil. A KBU official said the three KBA member broadcasters unanimously agreed to give broadcasting rights to North Korea as it is desirable in view of humanitarianism to help North Koreans to enjoy the Asian sports festival together and it would help boost South Korea's status in the international arena.